Community members are facing diabetes head-on by becoming knowledgeable about proper diet and exercise and concentrating on making lifestyle changes. Learning how to live healthier lifestyles is made easier by Memorial Hospital’s diabetes classes led by Molly Petrik , RD, LMNT, CDE: Sharon Luebbe, RN; and Connie Janicek, RN. Memorial Hospital's diabetes education program is certified by the American Diabetes Association and recognized by the Centers for Disease Control to prevent or delay type 2 diabetes. Eighty-six million Americans now have prediabetes – that’s 1 out of 3 adults. Memorial Hospital offers three different diabetes programs to fit a variety of needs. Diabetes Education is one-on-one and intended for individuals who have been diagnosed with type 2 diabetes. Diabetic Support Group is for anyone interested in diabetes or prevention. Diabetes Prevention Program is a 1-year program in a class/group setting. Diabetes Education: Randy Colberg of Seward wasn’t one to regularly attend doctor check-ups. After symptoms became too relevant to ignore, he met with Dr. Plasek who identified that Randy’s A1C was too high and recommended he attend Diabetes Education meetings at Memorial Hospital. Randy had one-on-one meetings tailored to his needs. He learned how to manage his symptoms, diet, activity and reading food labels. He had been eating just one large meal a day for about 12 years so nutrition was the hardest habit to adjust. Randy began documenting all food and snacks and developed a better eating routine. After 5 one-on-one meetings, dedication to lifestyle changes, and exercising, Randy is no longer on medication to manage diabetes. Diabetes Prevention Program: Larry Smith of Seward has some favorite ways to stay active including hunting, fishing, and visiting his family ranch. Although his hobbies kept him busy, Larry admits he was not paying attention to his eating habits. In late 2015 he was suffering from some arthritic pain that was beginning to interfere with daily activities. A trip to his doctor was a huge wake-up call as the doctor was very adamant that he needed to lose weight. Shortly after that doctor’s visit, Larry saw an ad in the local paper about the diabetes prevention program being offered at Memorial Hospital. Larry wasted no time joining this one-year program. He said these classes were much easier than any sort of diet. He enjoyed that there weren’t ‘off-limits’ items as restrictive diets have never worked for him in the past. Once he found out he could actually eat more while on this program by eating nutrient dense foods like fruits and vegetables he was sold. Drinking more water was key for Larry and he has also dedicated at least an hour every day to exercise walking. When he started the program in January of 2016, Larry was overweight, in pain, and taking three separate prescriptions. Since the completion of the one-year program, Larry has lost 46 lbs. and kept it off. Even more impressive is that Larry has been able to get off all of his medications. His healthier lifestyle is allowing him a more pain-free and fulfilling life. Nicki Schaefer of Staplehurst has also enjoyed the benefits of the diabetes prevention program. Nicki had a family history of diabetes and was alarmed when her labs came back with prediabetes levels. After having seen the health concerns her grandpa went through while struggling to control his diabetes, Nicki knew she had to make a change. Nicki’s aunt and uncle gave her a flyer about the Memorial Hospital diabetes programs. At first, she was hesitant but decided to join. Nicki has made improvements on exercising aiming for 30 minutes a day. She also tracks her steps to make sure she is reaching her goals. Not only has her whole family been supportive but her employer has as well. She now has a desk at work where she can convert from sitting to standing throughout the day. This young mother found her key to success was to work on portion control instead of making separate meals for her and the kids. Counting fat grams helped Nicki and she began reading nutrition labels regularly. Her tips to success include packing your lunch so you aren’t tempted to eat out and have a plan for social settings. Nicki’s favorite meal is any dish incorporating spaghetti squash. Nicki said, “I would recommend this program to anyone. It was the best year of my life!” Nicki said the first meeting was key to her success and sticking with the classes. She enjoyed the small groups that became family style meetings with an open and honest discussion on successes and challenges. After the one-year program, Nicki’s labs have shown significant improvements, including a reduction in weight, cholesterol and blood sugars. Although she enjoyed her weight loss, she was eager to share how drastic her energy levels increased and how overall, she feels so much better. 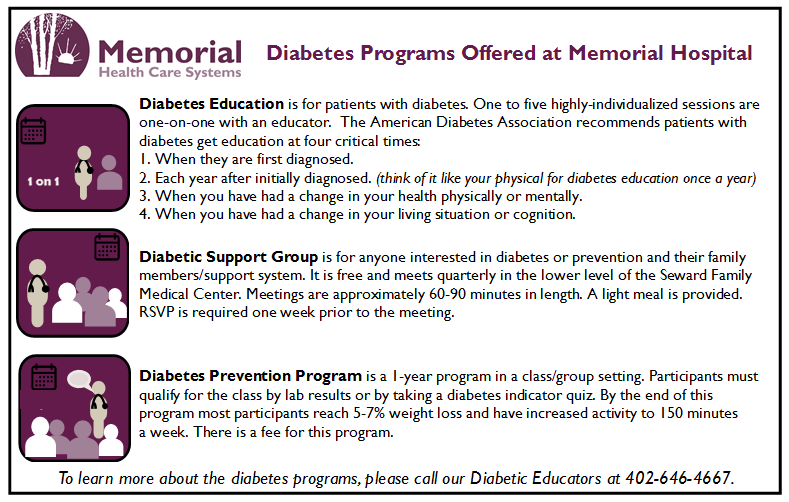 If you would like more information on the programs available, please call MHCS Diabetic Educators at 402-646-4667.